Data from a wide array of sources is displayed on maps. The command center fuses real-time information from monitors, imaging, scheduling, and maintenance. ArcGIS Desktop supports data processing and provides statistical analysis tools. At festival's end, tired pilgrims attending the Sunning of the Buddha Festival in the Chinese city of Xining (capital of Qinghai Province), board the Qinghai-Tibet Railway train and start the 26-hour trip home to Lhasa, capital of Tibet Province. Whether occupying seats or sleeper berths, they can rest assured that their overnight trip will be a safe one, thanks to the railway's high-tech control center that displays real-time information on the train's location and speed, oxygen levels, and even the electrical system. The control centerthe Comprehensive Monitoring System of Railway Operation and Safety for Tibetan Lineis the result of collaboration between the Qinghai-Tibet Railway Bureau and the State Key Laboratory of Rail Traffic Control and Safety at Beijing Jiaotong University. 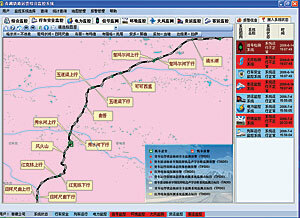 Map display of the Qinghai-Tibet Railway Bureau comprehensive monitoring system. Close monitoring is essential, because the train will climb from Xining (at an elevation of 2,275 meters [7,463 feet]) to cross the "roof of the world," a remote Himalayan plateau at an altitude of 4,000 meters (13,124 feet), before reaching its destination more than 1,900 kilometers (1,180 miles) away. When the railway section between Golmud (the second-largest city in Qinghai Province) and Lhasa opened in July 2006, it set several worldwide engineering records. More than 960 kilometers (597 miles) of track run at extreme altitudes, and more than half of the track runs across permafrost; this trackthe world's highest rail track, including the highest rail tunnelcrosses the Tanggula Pass at 5,072 meters (16,640 feet). At a cost of US$4.2 billion, the railway also has 675 bridges. To safeguard passengers from altitude sickness, passenger cars are pressurized and have supplemental oxygen systems. Even the train's diesel motor locomotives are specifically designed to operate at high altitudes. Since the official Qinghai-Tibet Railway opening one year ago, the railway has carried about 11 million tons of freight and 2.02 million passengersmostly college students, tourists, and businesspeoplewith very few incidents. During the railway's construction, planning engineers needed to design a control center that would receive and display data from the variety of monitoring devices and combine them with data from the railway's Microsoft and Oracle databases. They also were required to display photographs and satellite images of the landscape surrounding the tracks to support the emergency response planning and rescue system. The control center needed to help keep railway downtime to a minimum, monitor equipment, minimize maintenance needs, and provide a detailed record of environmental conditions along the track. Route information and query page. Esri China (Beijing) Limitedwhich was a consultant on this projectrecommended using Esri GIS technology to bring all this information together and display it on maps in the control center. 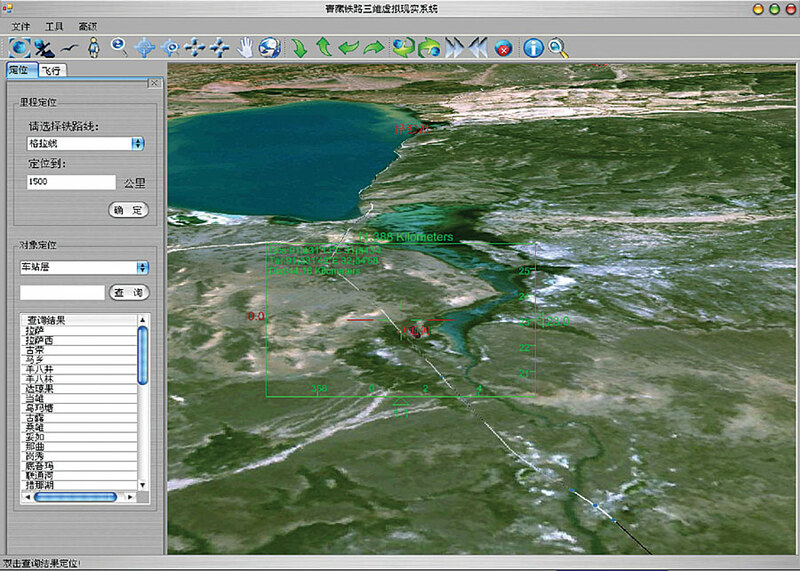 Subsequently, the State Key Laboratory of Rail Traffic Control and Safety and the Qinghai-Tibet Railway Bureau jointly developed the Web-enabled enterprise GIS. The resulting system displays maps, including 3D versions, and tracks a train's real-time location and current status. 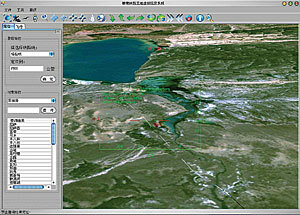 The system includes ArcGIS Desktop to support data processing and provides statistical analysis tools with the ArcGIS Spatial Analyst and ArcGIS 3D Analyst extensions. ArcSDE and ArcIMS technology makes it possible to manage spatial data and publish it on the train company's intranet. ArcGIS Engine was used to develop applications for comprehensive operation monitoring and emergency response. Information display options for the virtual 3D view of landscape along the Qinghai-Tibet Railway. The main source of railway supporting data comes from CAD design data (collected from the planning and design department) and satellite imagery of the surrounding landscape. The laboratory also collaborated with Leador Company, LTD (a Chinese company in Wuhan City that specializes in mobile mapping and survey software), to make a visual record of the track and landscape along the rail route, including precise location coordinates for the images. Leador used a survey vehicle equipped with a camcorder, camera, GPS, and digital compass to record data. Additional data comes from digital elevation models (DEM), 3D models, and databases created in the ArcGlobe environment of the ArcGIS 3D Analyst extension. 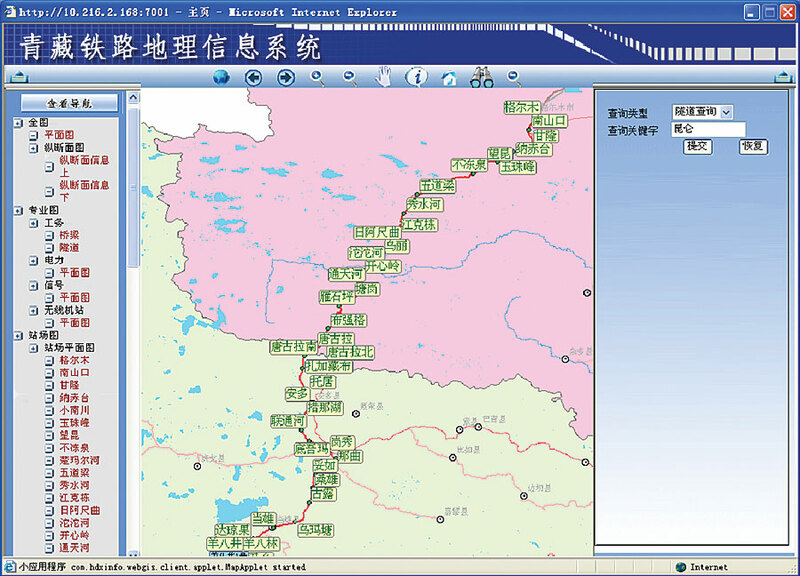 To resolve high-altitude communication and data transmission challenges, wireless data transfer technology was provided by Nortel Network and Beijing Xidian to transmit the real-time location of moving trains and other data to the control center, which manages comprehensive monitoring, emergency response, and information sharing. The control center fuses real-time monitor information, such as train data (location, speed, staff, passengers), passenger car conditions (temperature, balance), and the electrical system (voltage, current), and displays it on digital maps. Weather conditions and images along the route can also be retrieved. The operator can change the area displayed and zoom in on any particular section of the railroad line to a predetermined resolution. Message alert icons appear on the map to give the operator the location of any problems and point to the relevant data. Users are able to browse maps; query and display infrastructure features by location; retrieve geographic data, photographs, and video; and manage and search for metadata. 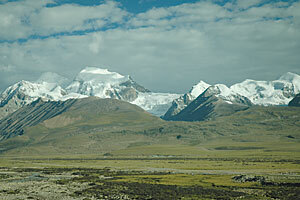 The Nyainqêntanglha Mountains of Tibet are part of the spectacular scenery enjoyed by train passengers. Photo by Cindy Shen. The center's emergency response system supports the emergency commander's need to capture, analyze, and process location data vital for organizing a response. The system uses ArcGIS technology to create a 3D visualization of the land surrounding a rescue scene and produce static rescue maps (e.g., maps showing potential helicopter landing zones). These printed maps provide information needed to coordinate rescue teams and relief trains and identify possible sources of problems. In addition, the center's intranet system provides a way to coordinate efforts with other sectors, such as public safety, hospitals, and local authorities. "The Comprehensive Monitoring System contributes to the safe, reliable, and efficient operation of the Qinghai-Tibet Railway by combining and displaying information essential for informed decision making," says Francis Ho, president of Esri China (Beijing). "We are very glad to have contributed to this great project." For more information on the State Key Laboratory of Rail Traffic Control and Safety, Beijing Jiaotong University, visit www.njtu.edu.cn. For more information on the Qinghai-Tibet Railway train, visit the railway's official Web site at www.chinatibettrain.com. For more information about this and other transportation GIS applications, visit www.esri.com/transportation or www.esrichina-bj.cn or contact Esri China (Beijing) Limited (e-mail: francis-ho@esrichina-bj.cn).